Discover the indulgence and beauty of King Island with our unique day flight experience including Champagne on arrival, return flights in a classic DC3, lunch and photo opportunities abound! King Island holds a special place in our hearts, it represents an undisturbed past era, with very few traces of tourism evident - the air is fresh, the people are friendly, the produce is absolutely sensational! King Island beef, cheese, yoghurt and crayfish are rightly world renowned, while what people don’t know is that the King Island Bakery pies are to die for! Regular Sunday trips commence at 10:00 am at our Silver Clipper VIP Lounge with light refreshments and Champagne. 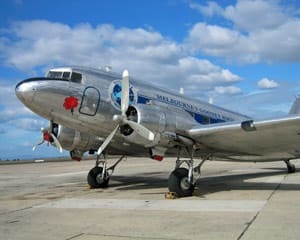 Jump on board the DC3 at 10:30am for the 1 hour 10 minute flight, usually flown at low altitudes past the city skyline into Port Phillip Bay, through the Heads and on to King Island. On arrival passengers are met by coach and transferred to ‘Boomerang By The Sea’, located in Currie. The dining space is situated overlooking the Western coast, with views of this astounding vista. Lunch is buffet style, with an emphasis on local King Island fare. 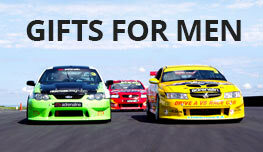 Seating can be arranged as desired, with the group or individually. After lunch the coach will take you to the King Island Cheese Factory where more temptation awaits. We then return to the aircraft for a 4.00pm departure. King Island buffet style lunch at "Boomerang By The Sea"
Flights run on scheduled Sundays, and are subject to minimum bookings. King Island Oysters Natural with our own seafood sauce. Tasmanian Smoked Salmon with capers, lemon slices and horseradish cream. Warm Roasted Kind Island Scotch Fillet Beef. Whole baked fresh Tasmanian Salmon with lemon aioli. Crispy Green leafed Garden Salad. Tomato, olive and onion salad drizzled with balsamic dressing. King Island Cheese Platter featuring Black Label Brie, Red Wax Cheddar. World prize winning Roaring Forties Blue with quince paste. Selection of King Island Breads and spreads. Variety of freshly made desserts with King Island cream. What a great day - staff were wonderful. PIlots very communicative and set the scene for the day. Food fabulous, Cheese factory with yummy cheeses - filled my eski!!! Cant believe such smooth landings of the Gooney Bird. All in all a wonderful adventure. Thanks everyone. Directions to and from Western Ring Road would have been a bonus. Loved our day on the DC3. The only thing I could recommend is to have a more stable set of steps to get on/off at King Island. It was quite an effort to get my father in law up & down these. Overall it was wonderful. Wonderful day the weather was fantastic flight was fantastic lunch was excellent Cheese factory and bakery stop over were all excellent. 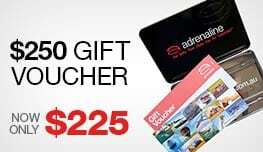 The Adrenalin voucher was a gift f service from my employer and the adventure selected was done over the internet, so I haven't really had any dealings with the Adrenalin staff. Right from the start, our trip to King Is.was one of the most relaxing experiences we have had. From the welcoming champagne and the laid back manner of the staff to the wonderful DC3 plane ride with the 1940's music and the interesting guide from our wonderful pilots and hostess we felt totally at ease. A fabulous day. Thank you.